On the morning of July 20, 2015, Cuba officially opened its Embassy in Washington, D.C., and the United States did likewise in Havana although the ceremonial opening of the latter will be on August 14 when Secretary of State John Kerry goes to Havana to preside over that event. This post will focus on the ceremonial opening of the Cuban Embassy; subsequent posts will discuss the afternoon’s joint press conference at the U.S. Department of State by U.S. Secretary of State John Kerry and Cuba’s Foreign Minister Bruno Rodriguez as well as reactions to the reopening of the embassies. Cuba’s opening was celebrated in the morning by the raising of its flag in front of its former Interests Section building. It was the same flag that was removed 54 years ago when the two countries severed diplomatic relations. The event was attended by more than 500 people, including U.S. Assistant Secretary of State Roberta Jacobson, who led the U.S. delegation in negotiations with Cuba after the December 17, 2014, announcement of rapprochement; Tom Malinowski, Assistant Secretary for Democracy, Human Rights and Labor of the State Department, who has participated in those negotiations; Jeffrey DeLaurentis, current charge d’affaires of the U.S. Embassy in Havana; Ben Rhodes, U.S. Deputy National Security Advisor who led 18 months of behind-the-scenes secret negotiations with Cuban officials with the aim of restoring diplomatic ties; Wayne Smith, a Cuban expert who was forced to leave the U.S. Embassy in Havana in 1961 when the two countries broke diplomatic ties; U.S. Senators Patrick Leahy (Dem, VT), Amy Klobuchar (Dem., MN) and Jeff Flake (Rep., AZ) along with U.S. Representatives Barbara Lee (Dem., CA), Donna Edwards (Dem., MD), Kathy Castor (Dem., FL), Karen Bass (Dem., CA) and Raul Grijalva (Dem., AZ). The attendees then went inside the Embassy, where they heard a speech by Cuba’s Foreign Minister, Bruno Rodriguez. Here are excerpts from those remarks. “Every step forward will receive the recognition and the favorable acceptance of our people and government, and most certainly the encouragement and approval of Latin America and the Caribbean and the entire world. With the ceremonial opening of the U.S. Embassy in Havana not happening until August 14, the changes there were subtler. There was no raising of the U.S. flag. There was no changing of the sign on the building. The U.S. diplomats who previously worked in the Interests Section now worked in the Embassy. A future post will review the ceremonial opening of the Embassy, now scheduled for August 14. This post is based upon the following: Ahmed & Davis, U.S. and Cuba Reopen Long-Closed Embassies, N.Y. Times (July 20, 2015); Schwartz, Embassies Reopen, as U.S., Cuba Restore Ties, W.S.J. 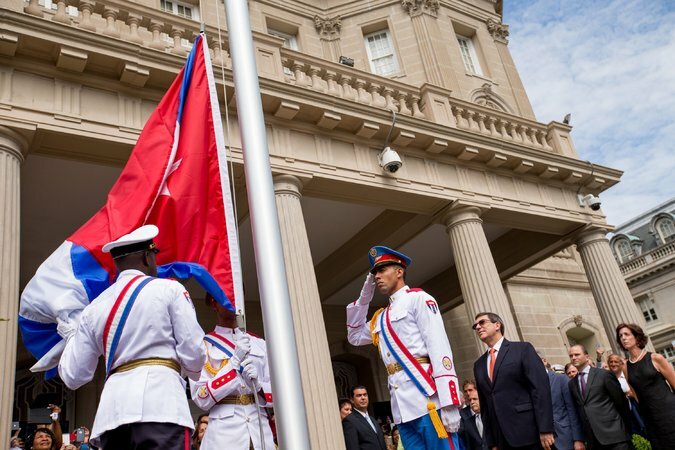 (July 20, 2015); Ayuso, ‘Mojito diplomacy’ as Cuba reboots US relations in reopened embassy, El Pais (July 21, 2015); Gómez, Cuban flag waves in U.S. capital, Granma (July 20, 2015); Gómez, The flag day, Granma (July 21, 2015). The famous Cuban-American jazz pianist and a resident of Minnesota, Nachito Herrera, was invited to attend the opening of the Cuban Embassy, but unfortunately had to decline because of previously scheduled performances at the Dakota Jazz Club in Minneapolis with his new group The Universals, featuring saxophonist Mike Phillips, who has worked with Prince and Stevie Wonder; Cuban drummer Raul Pineda; Senegal bassist Cheikh Ndoye; and violinist Karen Briggs. (Bream, On special day for Cuba, Nachito Herrera gets emotional at the Dakota, StarTribune (July 21, 2015).) As previously noted in this blog, Nachito has frequently performed at Minneapolis’ Westminster Presbyterian Church. A similar press release was issued by Senator Leahy.